I am Sensei Stella your new coach in English! 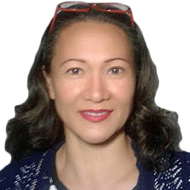 I am a full blooded Filipina who has a great desire to help students achieve their goals as far ans English language is concerned. I graduated from Mountain View College . I worked as a licensed radio announcer during my stay in the college for several years and and had worked as ESL teacher in Thailand for couple of years. Learning English is an adventure where you learn different cultures in different backgrounds. I am a flexible teacher who can accommodate student in different age levels. I can teach advance students who are taking TOIEC, TOEFL, IELTS, free talking, daily English and the like. I love to break down English into simpler terms to make it more understandable to those who need help in improving their English language skills. pronunciation, proper diction, correct grammar, and help you develop your confidence in using English to interact with others in all walks of life. This is Sensei Stella, inviting you to have fun with me in EIGORU online school.